This program is based on the belief that the salesperson who acts like a leader will indeed be seen as a leader and will develop better customers. Developing this leadership attitude across an entire sale team can have dramatic positive impact on the bottom line. Too many salespeople don’t understand their role. They see it as selling a product or a service — when in fact the sales rep’s role is to show the prospect what is changing in their industry, strategies they can deploy to avoid mistakes that their competitors are making and be a true partner, rather than a vendor. 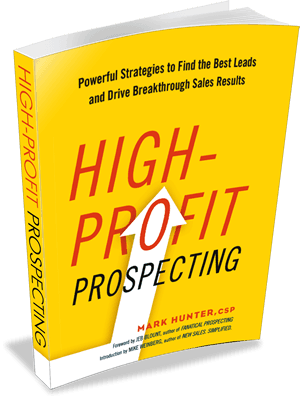 In this program, Mark Hunter, CSP, “The Sales Hunter,” gets up close with personal leadership stories that pull people in and create lasting change. Attendees will understand why being seen as a leader is essential if they expect their customers to see them differently and have greater respect for them. Attendees will learn how to use influence and impact to create legacy outcomes. Attendees will see how motivation is not something others do for them, but what they do for themselves. Attendees will understand how to use “sales leadership” to open up new opportunities with existing accounts and new accounts. This program serves well for a sales meeting that will include marketing presentations or other company-focused initiatives where the organization change is expected. Excellent for sales teams that are demotivated or are seen in the marketplace as struggling to find their place. Excellent for association events what will have a diverse audience and numerous topics presented. Fits well with association events that need to attract senior level people to the conference.